The 2017 Ford Explorer offers a spacious, quiet, and feature-packed interior, with higher trim levels indulging drivers with the downright luxurious. Combining three rows of seating with premium materials and inviting design style, the Ford Explorer perfectly encapsulates the driving motivation of the modern SUV; it’s family-friendly, thoroughly engaging, and feels like a home away from home. The three-row SUV has somewhat eclipsed the popularity of the minivan, and the new Explorer demonstrates why. Three rows of seating provide more than enough room to take seven passengers in total comfort, and the vehicle’s long and wide-opening doors make entering and exiting a snap. For easier third-row access and roomy second-row accommodations, you can even opt for second-row captain’s chairs. To push interior comfort even further, think about adopting the indulgent interior amenities of the Platinum trim. Real wood along the steering wheel casts an upscale atmosphere, and seats are upholstered with unique Nirvana leather and perforated and quilted inserts in either Ceramic and Ebony. A dual-panel moonroof extends above you to flood the interior with warm natural light, and a 500-watt Sony audio system can fill your cabin with rich and immersive sound. 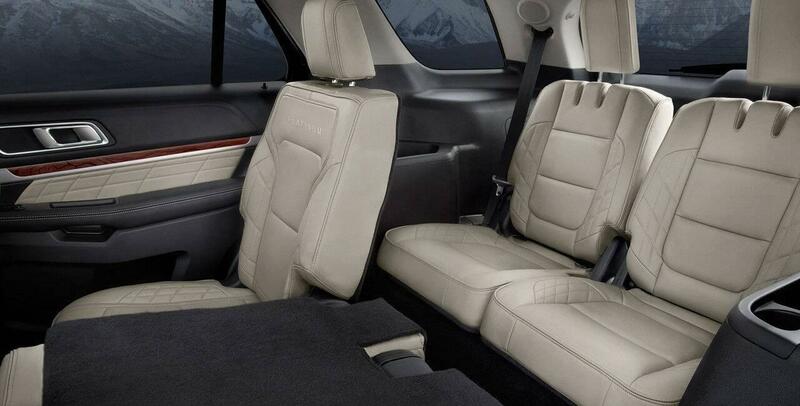 The interior of the Ford Explorer brings together everything you could want in a modern three-row SUV. Whether taking a quick trip from Naperville to Aurora or running cross-country from Plainfield to one of the coasts, you’ll never run low on space, luxury, or overall comfort. Our financing experts can help craft a payment plan that works around your needs, and our sales team can help you find your ideal trim level. All you have to do is pick up the phone and contact us today.